This self-drive package let's you move at your own pace. The package includes return ferry travel for 2 adults and a standard vehicle, 2 nights accommodation in a Sorrento Room at Kangaroo Island Seafront, Penneshaw including daily full buffet breakfast. You'll also receive a bottle of Kangaroo Island wine on arrival, a $60 dinner voucher for Penny's Restaurant at the Penneshaw Hotel, gourmet lunch at Dudley Wines with a glass of wine per person and a wine tasting at Bay of Shoals, with a savoury platter included. From $493 per person, twin share, this package is valid from 1st April 2019 to 31st March 2020. This fabulous new food and wine tour of Kangaroo Island with SeaLink will spoil your senses. You'll visit local boutique industries, sampling their incredible food, and see some of the natural attractions on Kangaroo Island. A few of the places you will visit includes Kangaroo Island Spirits, Sunset Food and Wine Restaurant, Island Beehive and Dudley Wines. See the natural beauty of the island when stopping by Remarkable Rocks, Admirals Arch, Kelly Hill Caves and Raptor Domain to see the Birds of Prey In-Flight Display. From $817 per person, twin share. Prices valid from 1st of April 2019 to 31st of March 2020. 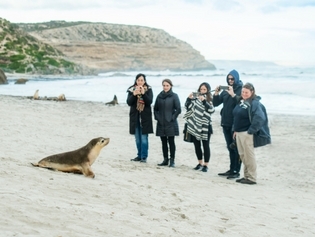 Join a luxury small group tour with tour operator, Kangaroo Island Odysseys. These personalised tours are curated so you can explore the island's wildlife such as kangaroos, koalas, emus and sea lions in their natural habitats, as well as enjoying the incredible local food and wine produce. See the famous formations of the Remarkable Rocks and Admirals Arch, and visit unique small boutique food producers such as Kangaroo Island Spirits and Bay of Shoals Wines. A highlight of the three days is a three-hour marine adventure, where you'll have the opportunity to swim with our friendly but curious bottle-nose dolphins. For more information on prices and departure dates, visit the Kangaroo Island Odysseys website. 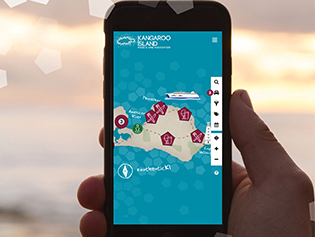 Use this newly-launched interactive map to plan your itinerary to Kangaroo Island's local industries and then navigate your way around the island. 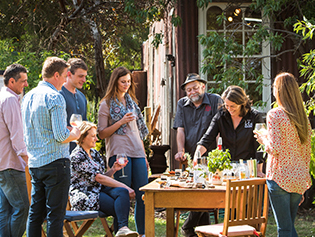 Plan out your route of Kangaroo Island to all the best spots to eat and drink, including farm gates, cellar doors, cafes, restaurants, markets, cooking classes and events. More venues will be added all the time so unlike a printed map it will always be up-to-date! Give the map a go from your smart phone or tablet, and even email your itinerary to friends. Sample and purchase a range of fresh local produce from the very people who grow, farm or make it at the Penneshaw Markets. Breakfast, coffee and a great village atmosphere are all on offer. The Markets take place on the first Sunday of every month October to April, plus additional markets are added during Summer, on Easter Sunday and during Cruise Ship visits. Come along to the Penneshaw Oval between 9.00 AM - 1.00 PM where you will be delighted by a selection of Kangaroo Island’s top food producers. Why not take advantage of SeaLink's special Market Day Fares to the island for $43* return per person on the day and enjoy lunch at one of Penneshaw’s cafes or the Penneshaw Hotel. Relax on the beach, hike on one of the great walking trails around Penneshaw or visit some of the island's unique cellar doors. *Conditions apply. A few things to put on your plate! You’ll also find some of the best producers of organic honey in the world on Kangaroo Island. Our famous honey is made from the Ligurian Bee, imported from Italy in 1884 and still the only pure strain of bee in the world. The Island was declared a bee sanctuary in 1885. Visit Clifford’s Honey Farm & Island Beehive. Abalone is a highly valued seafood delicacy often placed in the luxury category alongside truffles and the best caviar. Kangaroo Island Abalone is a pioneer of abalone aquaculture and has one of the largest operations of its kind in Australia. Kangaroo Island abalone and abalini can be purchased from The Oyster farm Shop. The Oyster Farm Shop showcases the best of Kangaroo Island’s Aquaculture and Sustainable Seafood. Located in American River, you can buy farm-gate Deep Water Premiums and Coastal Cream Oysters plus KI Abalone, Marron and King George Whiting. Sample Sheoak Smoked Oysters and a range of home-made sauces and smoked oyster dip. High quality Kangaroo Island lamb is produced from leaner, low stress lambs and is proving popular on tables and in restaurants across Australia. 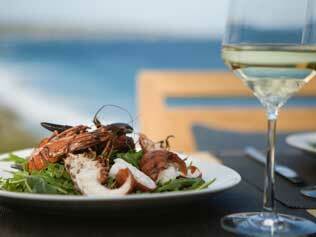 Kangaroo Island cafes and restaurants always serve local ingredients and produce. Visit South Rock Lamb. Kangaroo Island is an official wine region of Australia and today there are over 30 growers, 200 hectares of wines and 18 labels. Ciders and spirits are also made locally. Start your wine tour at Bay of Shoals Winery near Kingscote, sample some award winning wines while enjoying the stunning view over the Bay of Shoals. Pop over to the Heatland and visit Islander Estate Vineyards, where legendary Bordeaux winemaker Jacques Lurton uses traditional European winemaking methods. Tasting rooms now open at Cygnet River. Enjoy the stunning ocean views at Sunset Food & Wine in their new modern bistro that has a focus on seafood and South Australian produce (check opening times before visiting). Another worthy mention is Amadio Wines. You will find their cellar door located on 1 Commercial Street in Kingscote. Taste their Kangaroo Island and Adelaide Hills wines and enjoy rustic tapas style platters in their historical venue. Visit South Australia’s best Cellar Door Dudley Wines. Their modern Clifftop Cellar Door is located only 12km from Penneshaw, where you can taste their range of handcrafted wines and gourmet KI pizza, while enjoying the stunning views from the deck. And for something different, visit Kangaroo Island Spirits and try their honey and delicious flavoured liqueurs including honey and walnut, lime and ginger and anisette. This is an intimate and worthwhile cellar door experience. The Drunken Drone Brewery is a small microbrewery located at Clifford’s Honey Farm. Taste their popular ‘Honey Wheat Ale’ that is crafted in small batches and made with honey from the renowned Liguarian Bee. Kangaroo Island products are available in a convenient location in the centre of Adelaide. 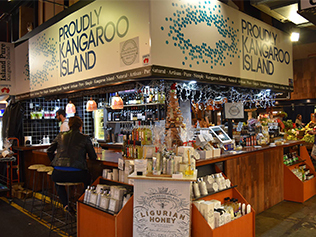 Stock up on your favourite Kangaroo Island produce, spirits, wine, health and beauty products at the Kangaroo Island Stall in the Adelaide Central Markets, stall 17. Browse over 450 products from 50 producers, or pick up a KI Coffee Roasters award-winning espresso, a light breakfast or lunch. If you can't visit the Adelaide Central Market, see the online shop for the full range of Kangaroo Island products delivered Australia wide.